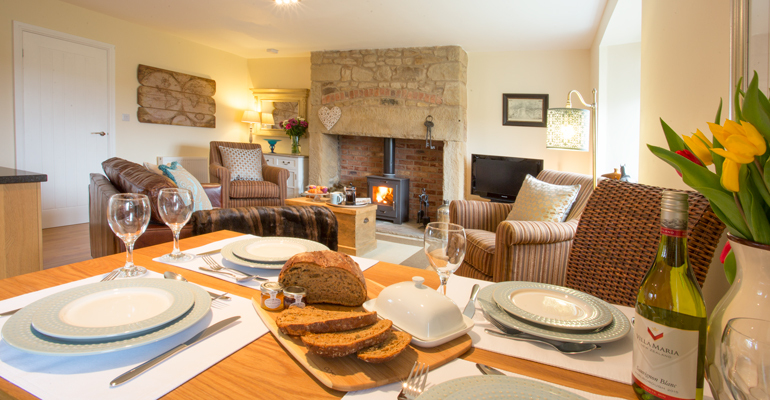 Honeycomb Cottage near Warkworth is an idyllic retreat in which to relax, unwind and to enjoy the best of what Northumberland has to offer. With pretty views over the flowering fields and lambs in the field in the springtime, this cottage is perfect for couples or a small family to have the perfect base for exploring Northumberland. South-facing with delightful countryside views, the cottage has the feel of being in the heart of the rural landscape. Yet within just 5 minutes drive you will reach the medieval village of Warkworth, with a range of gorgeous shops and country pubs to explore, as well as a 5 mile stretch of golden sandy beach (dog-friendly all year round too). The cottage has retained it’s original features, such as the impressive inglenook fireplace with a wood burning stove, with logs provided between October and April, decorated in delicate and neutral hues, combined with many thoughtful touches, your stay at Honeycomb Cottage is sure to be relaxing and comfortable. If this cottage is booked up for the dates you want, why not check out its sister cottages next door, Bumblebee Cottage and Dove Cottage. 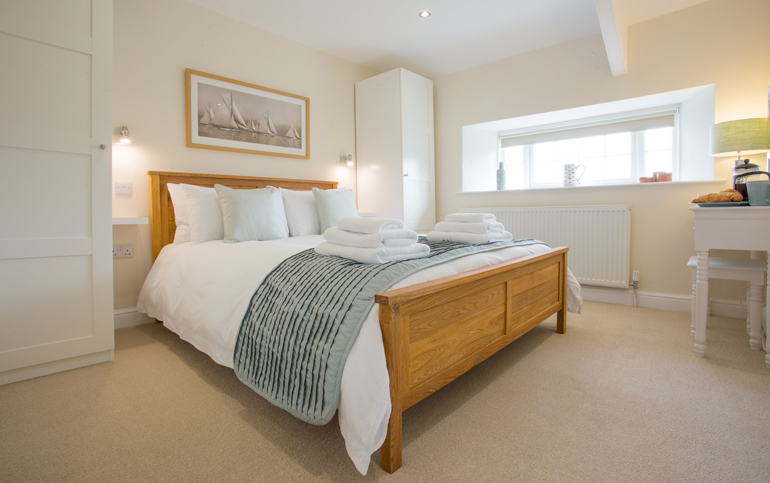 Honeycomb Cottage is very intimate for a romantic break away yet spacious enough for a family of 4. Two dogs are welcome at £20 each per holiday. Free super-fast broadband (wifi) . 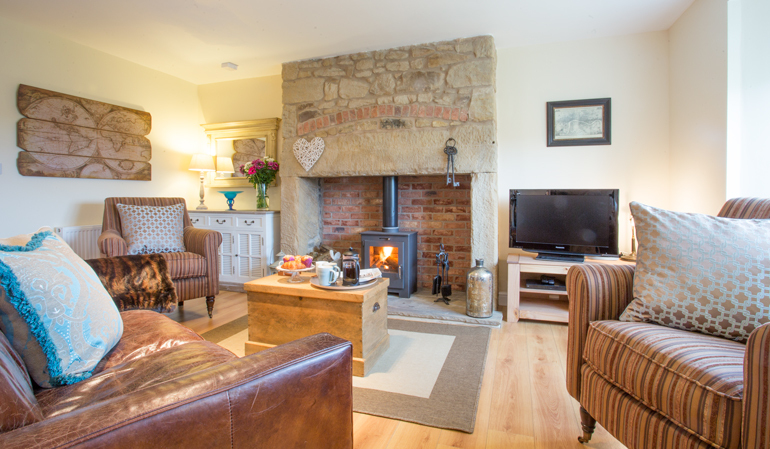 Honeycomb Cottage is centrally located to easily access all that Northumberland has to offer. Within 10 minutes you will reach the fascinating historic market town of Alnwick with its famous Alnwick Castle (used as the setting for Hogwart’s School in the Harry Potter films), and it’s stunning Gardens, as well as exploring the unique shops and fantastic little tea rooms in the town. The entrance into the cottage is via the utility room, perfect for depositing muddy boots and drying off wet dogs. This leads into the open plan living and dining area with an original inglenook fireplace housing a cosy wood-burning stove. Smart TV with access to the Netflix app and an Xbox 360 which doubles as a DVD player and a JBL Bluetooth speaker for use with smart phones and tablets etc. The kitchen is open plan to the dining area and lounge. This room is spacious and benefits from a large, south-facing window with a beautiful view of the open countryside, letting plenty of natural light flood into the room. 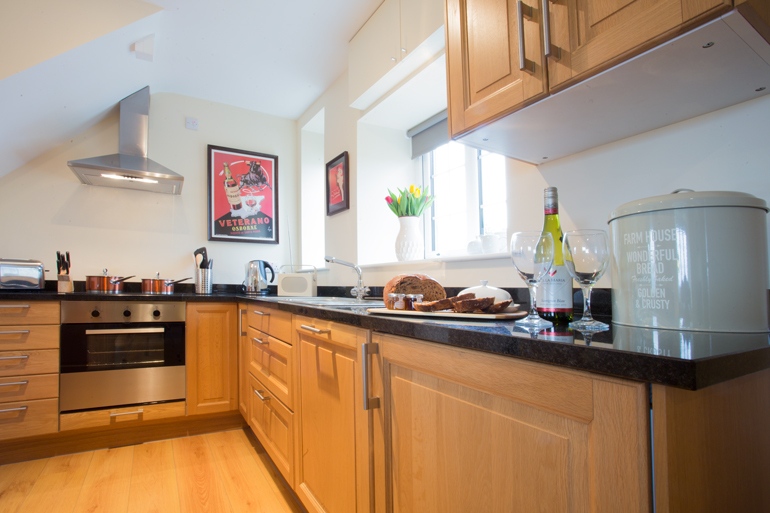 The spacious and well equipped kitchen has all the appliances you should require for your holiday, including a stainless steel electric oven and induction hob, full size dishwasher, washer/dryer (in the utility room), fridge, freezer (in the utility room), microwave, toaster and electric kettle. The first floor is spacious and all windows are south-facing with pretty open countryside views. The master bedroom has a large, south-facing window with a lovely open countryside view. King-size (5ft wide) bed and small wardrobes on either side of the bed with integrated shelves. There is a pretty dressing table area with a mirror and, stool and small drawers too. A blackout blind provides sleep comfort for bright sunny mornings. Luxury bed linen and white fluffy towels. The twin bedroom has 2 full-size single beds (3ft wide), a chest of drawers with mirror above and a wardrobe. You also have the option of the twin beds being converted to a super-king-size (6ft wide) bed for a small charge of £10. This can be requested on the booking form and is for adults only. There’s a blackout blind for shielding the sunshine on bright sunny mornings. Luxury bed linen and fluffy white towels. Modern, and spacious, the family bathroom has a large, frosted glass window providing plenty of natural light, a walk-in shower, wash hand basin and WC. Luxury White Company complimentary toiletries provided. There is a small, enclosed lawned garden to the front of Honeycomb Cottage with an approximate 4ft fence and a lovely view of the countryside. 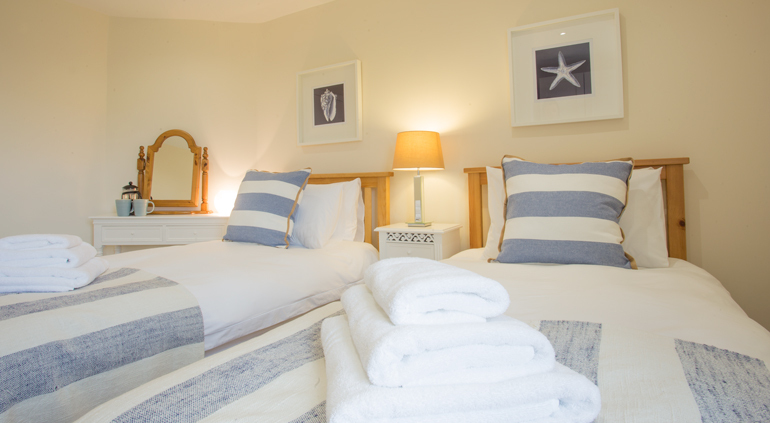 Comfort and style are the most important factors here at Honeycomb Cottage. Original sandstone fireplace with the soft leather sofa and squashy cushions all make for a ‘feet-up’ holiday whilst relaxing in style. The gorgeous lounge has an original sandstone inglenook fireplace and some lovely homely touches. A squashy sofa and 2 fabric armchairs sit around the fire with a large flat screen TV for cosy winter nights in front of the wood burning stove. The well-stocked oak kitchen has granite work surfaces, a DAB radio and a lovely welcome pack waiting for you when you arrive. The master bedroom has a kingsize (5ft wide) bed and is spacious and calm, overlooking the tranquil countryside beyond. Fluffy white towels are provided too. The new and modern bathroom has a walk-in large shower, sink unit, illuminated mirror and WC. White Company toiletries are complimentary too. Up to 4 guests in total, to include a baby sleeping in a travel cot. One baby welcome. Maximum occupancy of 4 includes a baby. Travel cot, highchair and stair gate available upon request. Two well-behaved dogs welcome for a small charge of £20 each per holiday. Booking conditions apply. Dog sitting service available. There is a small enclosed and lawned garden with a lovely countryside view to the front of Honeycomb Cottage with a 4ft high fence. There is a kettle BBQ provided at request all year round at Honeycomb Cottage. There is utensils and accessories provided. Please ensure the BBQ is cleaned prior to your departure. Private, off-road parking outside Honeycomb Cottage for 2 cars. Honeycomb Cottage sleeps a maximum of 4 persons, which includes a baby in a travel cot. Two dogs over the age of 1 yr old are welcome for a small charge of £20 each per holiday. Accommodation on 2 floors; on the ground floor, access is via the utility room with one step up to an open plan kitchen/lounge and dining room. On the first floor there are two bedrooms and a bathroom. The shower is level-access walk-in. Luxury welcome hamper including White Company toiletries, bespoke area and property guide and wood burning stove. Secure bike storage available on request. One double room with a king size bed (5ft wide), and one twin room with full size single beds (3ft wide) that can be converted into a super-king size bed (6ft wide) upon request. Non-feather duvets are provided on each bed. There is one non-feather pillow and one feathered pillow provided on each bed per person. If you require the entire bed to have non-feather pillows, please inform us at the time of booking or a minimum of 7 days before your holiday. 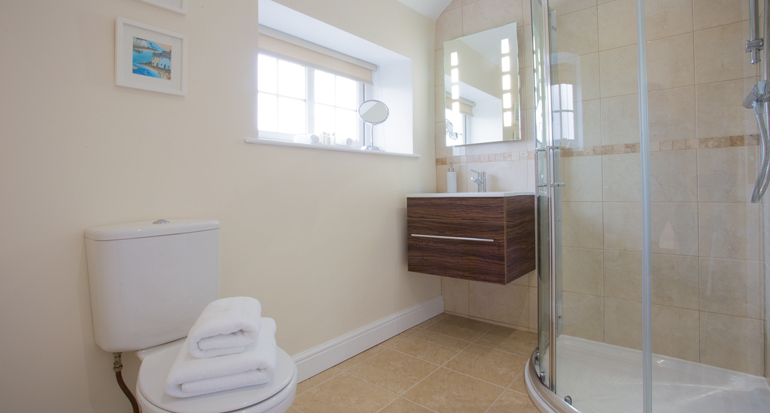 One bathroom with a large walk-in shower, WC and basin with heated towel rail. Fridge/freezer, electric oven, induction hob, dishwasher, microwave, toaster and kettle. Washer/dryer, iron, ironing board and vacuum. Hairdryer. Books, music and films. Smart TV in the lounge with Netflix app, an Xbox 360 which doubles as a DVD player, an iPod dock/music system and super fast broadband. Click the arrow below to view a virtual tour of Honeycomb Cottage, it’s just like walking around the cottage in virtual reality. 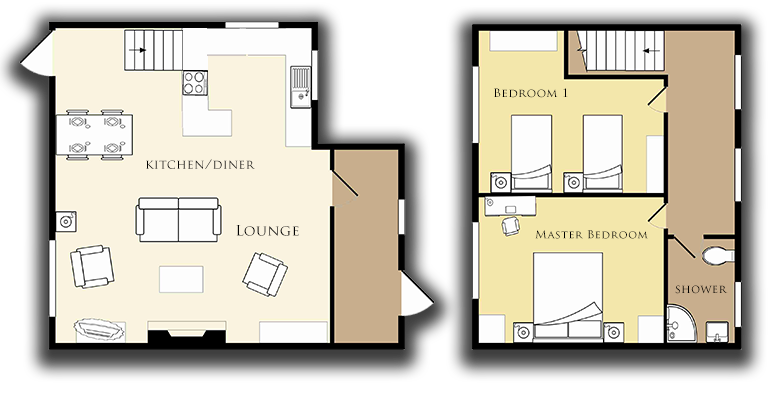 It also gives you a 3D floor plan, but you can also click on the plan to the right to enlarge it to view. Honeycomb Cottage has the best of both worlds; being right in the heart of the pretty countryside yet just minutes in the car to medieval Warkworth village. In Warkworth, you can find 4 dog-friendly pubs, all serving great food. 3 cafe’s – Bertrams is dog-friendly too! A couple of restaurants (our favourite is The Old Post Office), and a great selection of shops including a French Patisserie! Your nearest beach is also Warkworth, where there is free parking behind the dunes. It takes about 10 minutes in the car to get there. Druridge Bay, Alnmouth, Alnwick, Beadnell, Embleton, Seahouses and Bamburgh are all very easy to get to if you follow the well-signposted Coastal Route, as well as Craster on the coast too. Alternatively discover Rothbury and Kielder forest inland, famous for the Dark Skies – nothing like you have seen at home! You can explore the location of Honeycomb Cottage on the map below which gives you a good idea of the area. The postcode of the property is NE65 0YB. To find out the distance from your own home to Honeycomb Cottage, how long it will take to drive there and other options for alternative transport, click here: Honeycomb Cottage on Googlemaps and enter your home postcode in the box provided. First impression as ‘WOW’ and it continued all weekend! Very well equipped cottage with all the luxuries of home. Loved the rural location, and only a short drive to beaches etc… We loved Northumberland and will return soon. Coquet Cottages are the best! When it’s chilly outside and you need an afternoon ‘pick-me-up’, pop along to Cabosse, (the French Chocolatiere in the village) and ask for their signature hot chocolate. Louise Frederick – the owner – melts her handmade chocolate into hot milk, to create the silkiest, creamiest, richest hot chocolate you will have ever had. Warning: chocolate overload! Explore Thrunton Woods by trying one of their exhilarating walks to experience some of the best loved views of Northumberland from the top of lofty crags, through miles of maturing forest and open moorland. The two most popular trails are Crag Top Walk and Castle Hill Walk. You can park your car in the designated car park at Thrunton Woods and even take a picnic on a fine day. Thrunton Woods is located up the A697 north of Rothbury. Have a trip to Alnwick Castle and Gardens, and enjoy a spot of lunch at The Treehouse. Although not cheap to get into the attractions, the tickets do allow entry for a year so it’s an excuse to visit Northumberland again! Make sure you book up in advance at The Treehouse as it’s very popular. “Honeycomb Cottage, along with its sister properties Bumblebee Cottage and Dove Cottage, is a former farm-workers’ residence which we have recently renovated. We love the quiet location and wide open spaces, but also enjoy having easy access to the beautiful villages, stunning beaches and dramatic countryside close by. It’s a treat to watch the local wildlife just outside the window and to be nestled within the slow pace of rural life. The cottages are south-facing, so it’s lovely to curl up in a cosy chair, soaking up the warming sun and dramatic light during the day and gazing at the big, starry skies at night.